The digital measurement and analytics firm comScore released its latest report showcasing the latest trends on the smartphone market in the United States. Google’s Android remains the most dominant mobile OS, with Apple iOS coming in second. 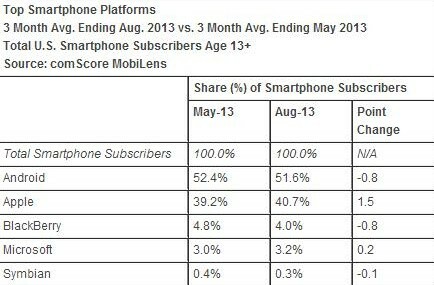 According to comScore’s data Android holds 51.6% total smartphones subscribers in August 2013– 0.8% less than it did in May this year. Android’s loss was Apple’s gain – iOS saw a bump of 1.5% on its way to a 40.7% share. BlackBerry, Microsoft, and Symbian complete the picture with 4%, 3.2%, and 0.3% respectively. The troubled Canadian manufacturer saw a 0.8% drop in its share, while Microsoft registered a gain of 0.2%. Symbian is slowly, but surely on its way out of the market – it lost 0.1% in the last three months. 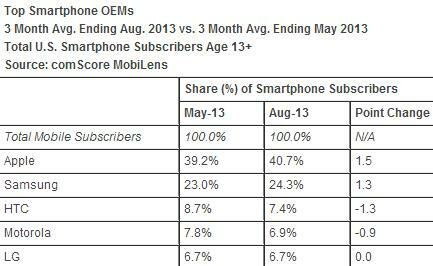 In the smartphone manufacturer’s field, Apple retained its top spot with 40.7% of the market in August 2013. The Cupertino giant registered an increase of 1.5% in its market share before the launch of its latest iPhone lineup, likely thanks to its recent partnership with T-Mobile. Samsung unsurprisingly came in second with 24.3% of the smartphone market – an increase of 1.3% compared to May this year. HTC is third with 7.4% of the market –1.3% less than in May. Motorola and LG complete the picture with 6.9 and 6.7% respectively.